Air Conditioning Standards Are Based on Male Metabolism : Shots - Health News Air conditioning standards are based on the needs of a 155-pound man. Researchers say it's time to admit that women don't need to be chilled as much and crank up the thermostat. It may be August, but in the office it feels like January. And there's a mysterious man to blame. He was probably about 40 years old, 155 pounds, white and wearing a suit. And he's the reason why women are shivering at their desks in air-conditioned buildings. At some point in the 1930s, someone defined "metabolic equivalents" — how much energy a body requires while sitting, walking and running. Almost a century later, the back-of-the-envelope calculations are considered a standard for many things, including air conditioning. But using that metabolic equivalent could be unnecessarily ramping up energy bills during summertime, researchers say, and it's time to plug in the right numbers so that air conditioning settings aren't biased toward men, and fewer women are reaching for the sweater. "Garbage in, garbage out," says Boris Kingma, a biophysicist at Maastricht University in the Netherlands and lead author of the study, published Monday in the journal Nature Climate Change. "So, if you put in the wrong metabolic rate, you get an answer which is of course not valid." Even while sitting quietly at a desk, the human body is working to keep everything running smoothly — the brain churning, blood flowing and vital organs at a cozy 98.6 degrees Fahrenheit. It has to work harder if the temperature isn't quite right. "Basically if you are sitting in an office and the temperature is neutral, then your body is able to completely control or maintain core temperature only by changing skin blood flow," says Kingma. If the temperature is just a little too cold, the body starts making tweaks to preserve heat. Vessels will keep blood closer to the body's core, leaving hands, feet and nose cold and pale. The person might feel the urge to grab a sweater or boil up some tea. In general, women feel colder than men do at the same air temperature. They prefer rooms at 77 degrees Fahrenheit, while men prefer 72. Body size and fat-to-muscle ratios are largely to blame for that discrepancy. "Fat cells produce less heat than muscle cells," explains Kingma, which is why women's higher fat-to-muscle ratio can make a difference. Plus women tend to be smaller than men, so "in general, women have a lower resting metabolic rate than males." To determine a female metabolic equivalent, Kingma had 16 women in T-shirts and sweatpants hang out in a temperature-controlled room, and calculated the rate at which they were consuming oxygen and releasing carbon dioxide. It's a good measure of how much energy someone's generating. He found that their metabolic rates were significantly lower than the standard resting metabolic rate. So their bodies actually needed higher room temperatures to be comfortable. This is just one of many studies over the years, from Japan to Finland, concluding that bodies of different sizes work really differently, depending on their dimensions, age and gender. Men and women of exactly the same size will produce different amounts of energy, because of slight variations in body function, skin surface area, organ size and fat distribution. Even though the energy requirements between bodies vary only slightly, Kingma argues, they can affect energy use in unpredictable ways. "If you are feeling a bit cold, you might drink a cup of tea more," he says. "And boiling a liter of water takes really a large amount of energy." There's no unified agreement on variations in metabolism among body types, says Bjarne Oleson, head of the International Center for Indoor Environment and Energy and professor at the Technical University of Denmark. What is clear is that Americans keep their buildings way too cold. In the summer, international standards recommend temperatures between 73 and 79 degrees Fahrenheit. "But very often when you are in the U.S., they are between [68 to 73 Fahrenheit], which is really what we recommend for winter," says Oleson. He thinks dress codes are more to blame for discomfort than temperature standards. "Women adapt much more their clothing in the summertime to the outside temperature than men do," says Oleson. But air conditioning is "operated so men in the business suit feel comfortable." All this temperature talk might seem silly; just put on a sweater, right? "But we know that temperature also influences your productivity," says Oleson. 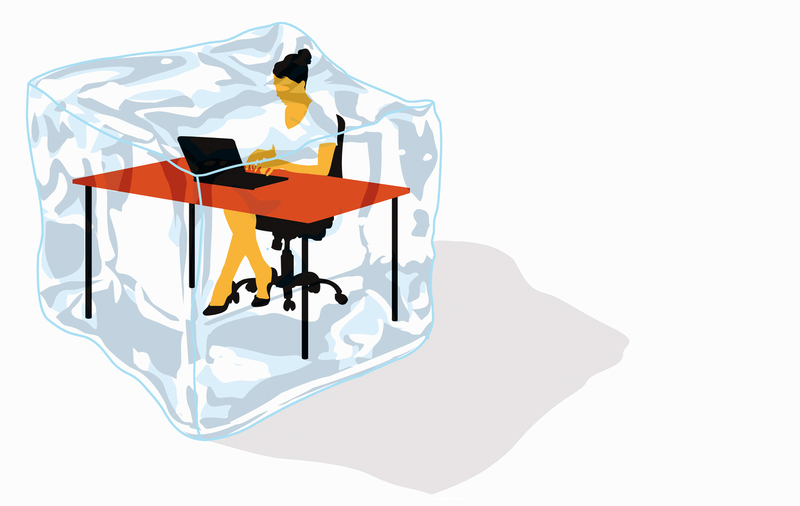 Uncomfortably chilly or hot offices can puncture concentration and increase errors in basic tasks like typing. Multiple studies have found that 72 degrees Fahrenheit is the best temperature for productivity and learning. Cold air is also expensive. In 2005, to cut energy bills and help the environment, Japan's Ministry of the Environment introduced a special summer dress code and cranked up the temperature in government offices to 82 degrees. Similar efforts in South Korea, the U.K., and at the United Nations headquarters in New York seem to have wilted. But after a decade, Japan's "Cool Biz" campaign is still going strong. Air conditioning temperature is just one standard that is coming under scrutiny as people start overhauling outdated standards based primarily on one body type. "In some instances, it's a matter of life and death, like for automobile safety," says science historian Londa Schiebinger, who runs the Gendered Innovations project at Stanford. She says the standard of the 155-pound male body pops up all over engineering, biomedical and health research. It's one reason why car crash-test dummies had to be redesigned, and why some medicines were recalled as too dangerous for women. Redesigning things to more accurately reflect the population, she says, can make life better for all, like when the cockpits of military aircraft were redesigned to fit female pilots, or when osteoporosis was reconsidered to include male patients. "My suggestion here would be that all engineers, architects, urban planners, automobile designers go back and look at their standards," she says. Then ask: "What is the basic standard that things are engineered for? Who is the assumed ideal subject or user?" And do they need a sweater?